The Text entered for the "Person or Group column" isn’t an item from the list. Select an item from the list, or enter text that matches one of the listed items. Root cause: This is by design! SharePoint 2010 datasheet view uses Microsoft access run time engine, which doesn't has any interface to connect and resolve user names from active directory (or any other authentication provider). So, it fetches user names from User information list of SharePoint site collection. That being said: If you enter a new user who is not there in UIL, datasheet view can't resolve it! 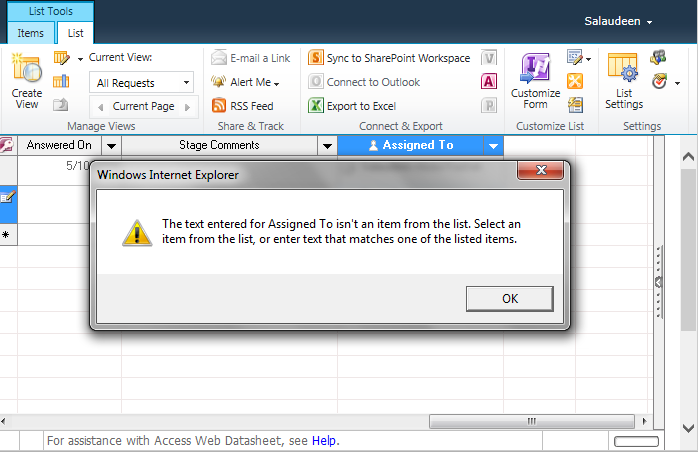 In order to fix this problem, prior copy-pasting to datasheet view, we should have them all in user information list! So, Just add all users from people picker column values to SharePoint site (E.g. you can add them to any group like site visitors) that will add users to UIL automatically!